E-mail with the button below your best friends to share with them how you picked up a free resume that is ready to use and free. That button is pretty handy. Locating our resume later for editing is by far easier. 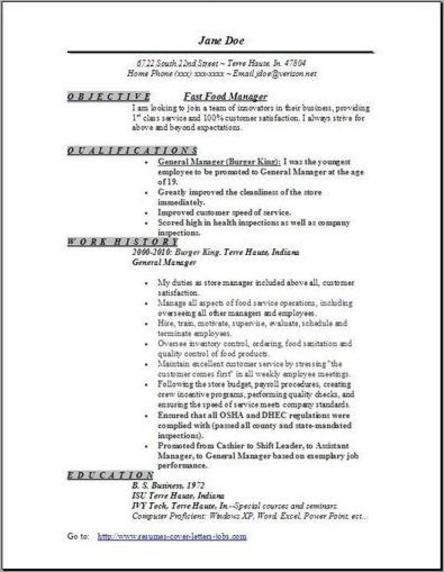 Use the 3 fast food manager resume formats available above, download them, then edit. Just try backspacing and also substitute any and all your original work history. Afterwards, compare those 3 you have completed and choose which one is best. It's oh so easy. Very very very easy, 10 to 20 minutes of your time and you will have completed a great resume. I know they will turn out great for you. 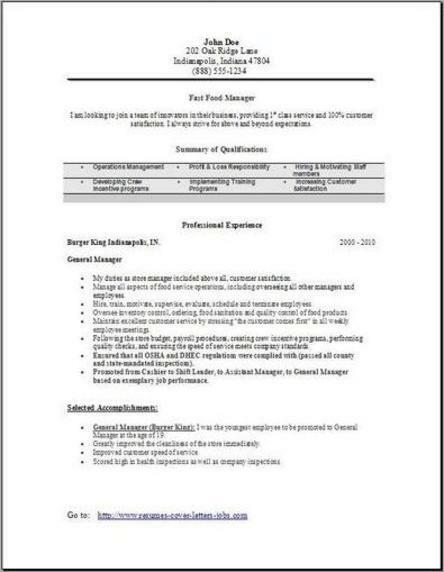 Now is the time to visit some of our other resume pages to build an even better resume. Use a certain section you like from them adding it to your resume would be a great addition. Make it very unique and also your own. 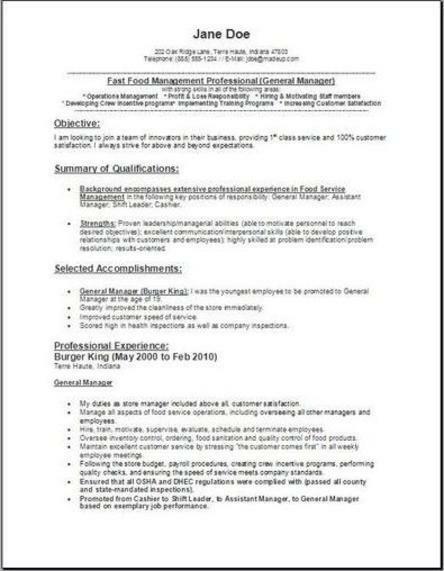 Fast Food Manager job duties: This is some useful info for your fast food manager resume. Food service managers are responsible for daily operations of the restaurant and oversee the preparation of the fast food meals and beverages to customers. Some of the most difficult situations can also be dealing with the customers to keep them happy. You need to have strong inventory management skills, arrange for equipment maintenance, and are in control of the upkeep of the entire facility and grounds. Managers also will perform various administrative assignments, like keeping employee work related records, preparation of the payroll for all employees, also completing the needed paperwork that complies with licensing, any tax, all wage and also hour, unemployment compensation, and finally Social Security laws. Many fast food managers will work long hours—12 to 15 per day, 50 or more per week, and sometimes 7 days a week if need be. Most managers are hired from within the ranks of the employees. Almost all employers will emphasize the personal qualities of an applicant when they are hiring managers. Workers that are very reliable, show great initiative, and also have very high leadership and unique qualities are the most sought after candidates for a promotion. The vast majority of restaurant managers are salaried. Forty-one percent of salaried management jobs for all food related type service managers are located in the full-service restaurant setting or limited-service with no seating eating places, such as most fast-food restaurants without dining in. Jobs are widely located throughout the country, with large cities and resort areas being where more opportunities will present themselves. This can be a rewarding career as you travel through the ranks and get promotions. After you make it to the top position, there are definitely greater opportunities waiting for you in the restaurant arena. If you are a go getter, you may even get promoted to district manager over several stores.